IT’S EASY to see why Lochnagar has been an inspiration to writers, poets and travellers for so many centuries. That great reveal, when you come face to face with the semi-circle of dark, brooding rock faces and the ink-spot lochan cradled in their shadow hundreds of feet beneath, never fails to produce a sharp intake of breath. Its magnetism is palpable; you are drawn to its depths, happy to join the battle between standing rooted to this spot for hours just marvelling at the wonder of nature or the urgent need to climb round the lip to discover what other joys await in this ultimate adventure playground. Like so many before, we did both. It was hard to tell the difference between those who were seeing this for the first time and the old hands. Everyone was stopped in their tracks, a reluctance to move from this spot too soon. In the end the decision was taken to have a ten-minute food stop even though we had been walking for less than an hour and a half. Blue skies and a flawless view will do that every time. For most, the plan had been just to summit Lochnagar, and we now had the unexpected bonus of decent weather. When we finally got moving again, you could feel the ambition had grown. Lochnagar had again inspired. There were nine of us, an annual gathering of old friends based at a house in Ballater for a week’s walking, varying levels of experience, stamina and ambition. We had arrived on the Friday night just a few days after winter had launched a sneak attack on spring. May was just a whisker away, but the temperatures had plummeted in Scotland’s north-east over the previous few days, and a late blast had topped up the late-lying snow in an area which tends to hold its cover longer than most. The talk that night was of winter gear, icy slopes and wind chill. More snow was also on the menu. We made an early start, a cautious drive down Glen Muick to a deserted car park, a slippery surface scoured by a swirling, sub-zero wind, the only hint of spring the sun glinting between the pines. The track that heads east was bone-hard but the view ahead was expansive: frozen-over patches of flood water amongst the dead vegetation, evergreen pine standing to attention on the next horizon, two rolling bumps immediately behind, devoid of any colour and then right at the centre Lochanagar, its high points plastered in white in contrast to the wall-to-wall blues above. Then the vegetation seemed to move and suddenly deer were everywhere, hundreds of them, invisible amongst the dun colours of the flats until they had made any movement, a perfect merging of flora and fauna. Their need for foraging was obviously greater than the need to flee. The winter reprise had come as a shock to them as well. We crossed streams that still had crusts of ice on the rocks. Here and there were the remainders of old snow banked up at the edges of the track, its slow melt having halted, leaving it in various states of suspended disintegration. The chill wind kept reminding us of its presence as we turned off the track after rounding the lower slopes of the Corbett Conachcraig for the upgraded stepped path up towards the gap between the outlying top of Meikle Pap on the right and the chaotic grey sheets of Cuidhe Crom to the left. 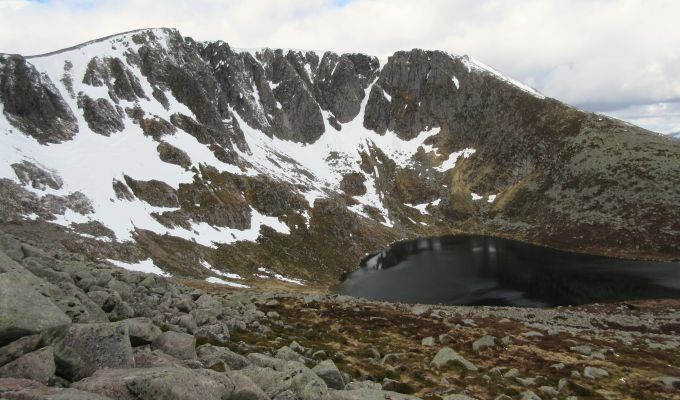 A short push up over the lip and Royal Deeside’s finest was dead ahead, dark, dark Lochnagar, its plunging cliffs streaked with snow, its reflection bringing light to half of the dark waters below. Even the optimists among us had not expected to be granted such a welcome. The forecasts of limited visibility and mixed rain and snow being driven in horizontally had so far failed to materialise. The path that hugs the rim of the corrie means the view is in no rush to disappear and it makes the ascent seem easier. By the time you do part company, the ground levels out and the change in the landscape is stark. The popular descent route heading south-east by the waters of the Glas Allt down to Loch Muick looked as if it was filled to the brim with snow while to the west lay the mountains of the White Mounth, a rolling series of high bumps indistinguishable from one another. The height gain continued at an easy angle following the line underneath the corrie rim but as we swung right on to the summit plateau we lost the protection we had enjoyed as the north-west winds whipped straight into us. The snow was only ankle deep in the main but the wind was creating little tornados of spindrift, fast-moving, larger than life ice-cream cones, which bit and stung exposed faces. 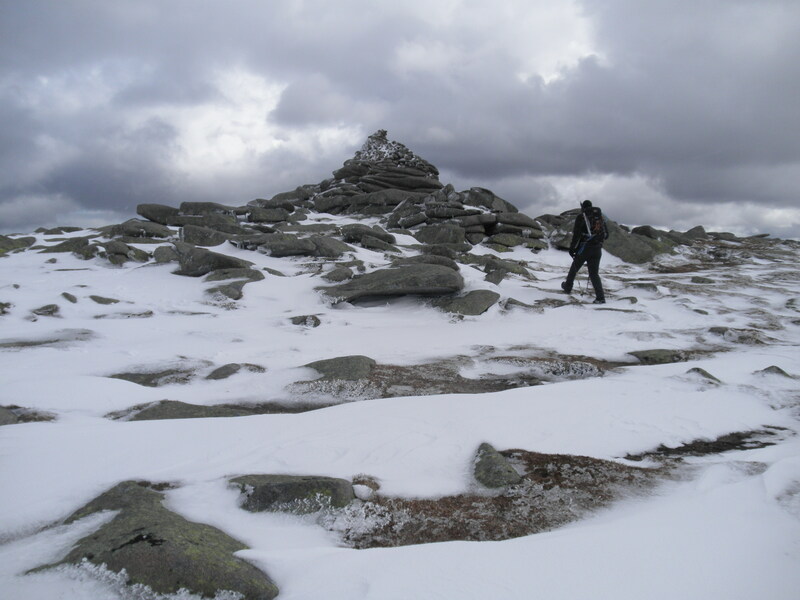 The drifts towards the cliff edge were substantial and the cairn at the first summit, Cac Carn Mor, lay across a barrier of iced granite blocks and deep snow filling in the gaps. The prominent main top of Cac Carn Beag lay only a few hundred metres further on but any chance of peering down into the Black Spout en route was ruled out by the solid wall of white guarding the entrance to this great rent on the skyline. When you gaze back across the summit area it’s easy to see why the original name for this mountain was Beinn na Coichan, the hill of the paps, as the two cairns stand out so prominently. From the main trig point on the stacked rocks of the summit, the bleak beauty stretching out westwards as far as the eye could see became even more pronounced. Directly below us in cold storage lay The Stuic, another fine corrie, almost a carbon copy of its bigger neighbour. The blocky stairway up the side of Loch nan Eun which provides a fine summer scramble looked a more formidable prospect in winter garb, white stripes juxtaposing with bare rock and the possibility of verglas lurking for the unwary. The day so far had been a pleasant surprise for those expecting a battle with the elements, and the mood of optimism implanted by that first sighting of Lochnagar had inspired a few to opt for continuing over the plateau on to the next two Munro summits of Carn a’ Choire Bhoidheach and then Carn an t-Saigart Mor. The possibility of adding Cairn Bannoch and Broad Cairn to complete the round of five had not been mentioned at this point. It just seemed too ambitious with such a mixed group and the promise of deteriorating weather over the next few hours. We split the party, those who were satisfied with their Lochnagar stroll heading back down the Glas Allt route to take in the waterfalls and the walk back along the northern shore of Loch Muick. The dramatic difference between the plunging cliffs on the northern side of the plateau and the vast openness of the land above them is immediately apparent when you drop off the back of Lochnagar and head south-west. The terrain is so gentle, soft grass, moss and lichen, and the next rise so imperceptible, that in clear conditions you have to remind yourself you are walking at around 3500 feet across an exposed plateau. It all seems so obvious, yet the featurelessness of the surroundings here should never be underestimated. This landscape can become confusing and serious in the blink of an eye. The short detour off to the cairn of Carn a’ Choire Bhoidheach is a great example - in mist it would be so easy to walk straight past it. The snow was now falling softly but persistently as we skirted round the side of Carn an t-Saigart Beag and on to its bigger sibling. It seemed rather fitting we were ascending this, the big hill of the priest, in such unseasonable conditions as it was named in honour of Padruig of Braemar who led his flock to Glen Callater to pray for an end to severe weather which had gripped his parish into late spring. Their prayers were answered, but ours were so far going unnoticed, the thickness of the snowfall giving us only a faint view of the Dubh Loch far below while ahead we seem to have invoked a plague of hares, with fleeting glimpses of white against white, blurs dashing across the eyeline with increasing regularity. We reached the twin cairns at the summit just in time for the snow to take a break and the cloud teased us with a now-you-see-it-now-you don’t attitude. Nature was fully in control as always, and it was interesting to see just how much of the aircraft wreckage scattered across this hill was being absorbed into the terrain. One of the wing sections of the English Electric Canberra B2 which smashed into the hillside in 1956 is slowly but inevitably being overwhelmed, gradually disappearing beneath a carpet of moss and soil while recent storms have relocated another substantial piece further down. This is also the mid-point of the walk. The decision now is whether is to head back towards Lochnagar and then down the Glas Allt path or continue on to complete the circuit. As these are my local hills, I argued that it was easier to keep the momentum going and complete the sweep right round the loch. The carrot for our Munro-baggers was another two peaks. The biggest worry was how fast the weather would start going downhill. It was scheduled to come in fast from the west and already the skies were growing blacker on the horizon, but at least it would be at our backs. Cairn Bannoch lies directly south-east, its stacked cairn on a rock pile standing out like a lighthouse a couple of kilometres away over gently rising slopes of short grass. Four down, one to go. We didn’t linger at the top, skirting round the top of Creag an Dubh-loch and its dark climbing crags facing off against Eagle’s Rock on the other side of the glen as the dark skies pursued us at gathering speed. Among our party was Jane, London-based and, before today, proud conqueror of one Munro. She had just increased her total five-fold in one day and was feeling extremely pleased with herself, but she was less pleased when she discovered we still had two and a half hours to go to get back to the cars. The snow duly arrived with renewed vigour as we hurried down the ridge. We stopped at the pony hut on the track down for a short reprieve and a bit of shelter, and then made our choice for the final push out. Two options - stick to the track which involved a short bit of ascent or drop quickly down into the depths of Corrie Chash and follow the shoreline to join up with the track further down. The sensible one when the weather is closing in is always to lose height so we took the corrie route. The path runs steeply down the right-hand side of the corrie with the loch drawing closer all the time, but the pace of some of the party had dropped off through a combination of tiredness, the realisation we still had two hours to go and the blizzard at our backs. At one point where a small stream drops across the path, a deep bank of solid snow blocked the path and it was sobering to see how nervous some members of the group were about going over it. The waters of the loch were hidden behind a moving white curtain during the charge along the path above the shore. I’m sure the same thought was echoing through every head as the snow got heavier and heavier: I’m glad we aren’t up the plateau now. By the time we reached the car park everything was buried in a thick white blanket and we were walking snowmen and women. I have walked this route before without needing to take my hands out of my pockets and with little map checking, and I have been up there walking blind. We had managed to get round the circuit of 18.5 miles in just over nine hours without any problems, but on another day it could have been a different story. We had completed a circuit of 18.5 miles over five Munros in conditions that swung from winter to spring and back again in 20-minute bursts. 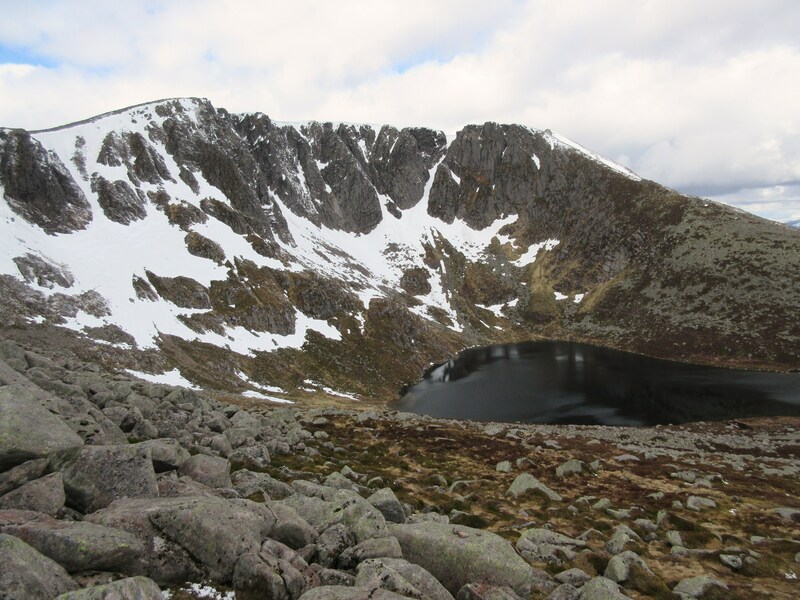 We had set off prepared to settle for a relatively short trek up Lochnagar in unseasonal weather as a gentle introduction to a week’s walking and ended up being carried round a full-on circuit on collective adrenaline and enthusiasm. Even our rookie, Jane, was carried along, hoping the day would never end. Until she realised how far it was to the car, that is. Lochnagar gets you like that. Once you climb over that lip and clap eyes on that handsome face it’s hard to escape its pull.